We are only at the beginning. I grew up not 5 miles from this World Famous Racetrack. I never saw a race there. (My mother did though!) 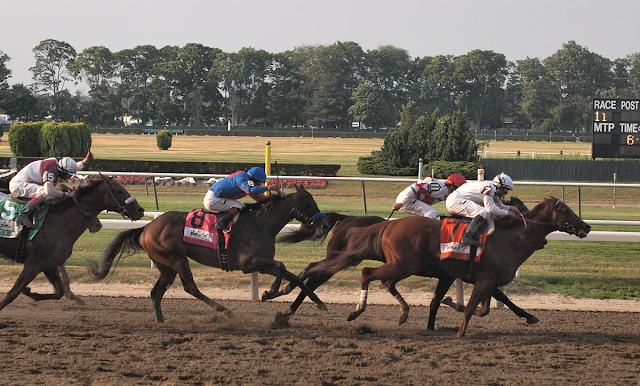 For many of the horses that run the Belmont Stakes, it is only the beginning for them. These horses are only 3 year olds and basically just starting their lives. Likewise, COMPUMATRIX is just starting it life as a company although it has been in the “making” for many years. Just as the horses running their race are on THE BACKSTRETCH of the track, they are making their FINAL DRIVE to the Finish Line. A year ago, a good friend told me: “how many businesses have you and I joined since we started this one and how many of them are still around?” The answer as to how many were still around at the time of this question is “0” (zero)! I’m too embarrassed to answer the other question! We were told by the management some time ago that this will change our lives forever. We didn’t realize just what they meant at the time. When we signed up, stayed the course and committed ourselves, we entered the Race of a Lifetime. As in horse racing, we are on the backstretch running for the final drive in the effort to finish the race on top. We have many competitors that have come to the track once they realized what the prize is. However, the sad part is too many of them have placed their bets on the wrong horse! Horse Racing is such a small industry that most of the players know each other. They study their competition. The only way to win is to be prepared. Not only do you need to know what your industry is but you have to know where it is going. In the industry of Cryptocurrency, we have already seen some of the competition, to use horse terminology, “pull up lame”! Referencing this, the owners have had to go out on the race track and haul their horse off because they were not prepared to finish the race. I was watching my company for some time before I realized we were in the Cryptocurrency Industry! I am stating this because our Founders were developing our business before most of the World was waking up! For many people, I will phrase it like this: “it would be like being in a farming family, getting up at 9am, going downstairs for breakfast and finding everyone has already eaten”! Compumatrix is more than a research or a blog. It is certainly more than having the passion for writing. We ensure that we make highly engaging content for our subscribers which will enable them to enrich their understanding and enhance their lives. Our contributors understand that together, we can all succeed. © 2014. Compumatrix and Networks International, Inc. Powered by Blogger.